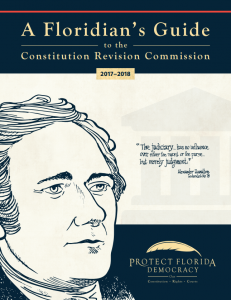 With a survey showing that 9 of 10 Floridians are unaware of what the Constitution Revision Commission does, The Florida Bar in October 2017 launched Protect Florida Democracy: Our Constitution, Our Rights, Our Courts, a statewide public education program to fill the void in Floridians’ awareness of constitution revision and engage Floridians in this critical process. The Bar engaged Floridians in Protect Florida Democracy through an informational website, weekly newsletter, statewide speakers bureau and engaging social media campaign. All CRC committee meetings were open to the public and livestreamed by The Florida Channel on www.TheFloridaChannel.org. Visit flcrc.gov/Committees for additional information on CRC committees and meetings. Pursuant to the rules adopted on June 6, the CRC schedule was determined by the Rules and Administration Committee. For the schedule of public hearings, appearance forms and FAQ, go to FLCRC.GOV . 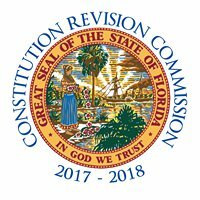 Video of all public hearings and meetings held by the CRC is available on The Florida Channel website. Floridians also received updates from the CRC on Twitter (@FloridaCRC) and on Facebook (@FloridaCRC). On July 14, CRC Chairman Carlos Beruff announced committee assignments. *Each one-hour webinar is approved for 1.0 General CLE Credits and 1.0 /State and Federal Government and Administrative Practice Certification Credits; and the Taxation webinar, in addition to being approved for the credits above, has also been approved for 1.0 Tax Law Certification Credits. 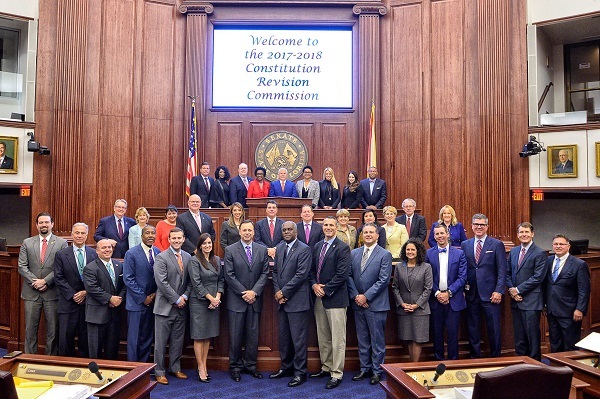 The Florida Bar is a member of the Partnership for Revising Florida’s Constitution and is committed to providing public education on the CRC and the process. Partnership for Revising Florida’s Constitution. CRC Chairman Carlos Beruff held an interview with The Florida Channel to discuss the CRC’s ongoing efforts to travel the state and listen to Floridians as part of its ‘Floridians Speak, We Listen’ tour. Watch. 2017 -18 Citizens’ Guide to the Constitution Revision Commission. 2017 -18 Citizens’ Guide to the Constitution Revision Commission- Spanish. Infographics (.pdfs): May be used on websites and in publications. Who Serves on the Commission? February 5, 2017 – Within 30 days of the convening of the 2017 Regular Legislative Session (March 7, 2017), the Constitution Revision Commission shall be established. It shall be composed of the Attorney General, 15 members selected by the Governor, 9 members selected by the Speaker of the House of Representatives, 9 members selected by the President of the Senate, and 3 members selected by the Chief Justice of the Supreme Court. (Art. XI, 2(a)). The Governor designates the chair (Art. XI, 2(b)). Any proposed amendment of a section or revision of one or more articles or the whole constitution must be proposed by a joint resolution approved by 3/5 of the membership of each house of the Legislature. (Art. XI, 1).Any proposal to amend the constitution must be submitted to the electors at the next General Election that is held more than 90 days after the proposal is filed with the Secretary of State. However, a single amendment or revision may be submitted at a special election held at least 90 days after the proposal is filed if authorized by law enacted by 3/4 of the membership of each house of the Legislature. (Art. XI, 5(a)).March 20, 2017 – First organizational meeting. January 9, 2018 – March 9, 2018 – Regular Legislative Session (ch. 2016-218, Laws of Florida). May 10, 2018 – Not later than 180 days before the General Election, any proposals to revise the constitution by the Constitution Revision Commission must be filed with the Secretary of State (Art. XI, 2(c)). November 6, 2018 – A General Election shall be held in each county on the first Tuesday after the first Monday in November of each even-numbered year (Art. VI, 5(a)). January 8, 2019 – If a proposed amendment or revision of the constitution is approved by at least 60% of the electors voting on the measure and, unless another date is specified in the amendment or revision, the amendment shall be effective on the first Tuesday after the first Monday in January following the General Election. (Art. XI, 5(e)).